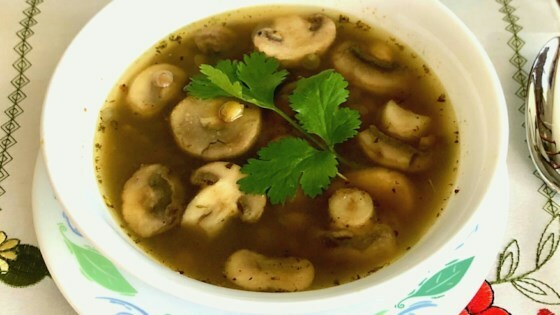 "Packed with fiber and protein, this flavorful lentil soup with mushrooms is not only good for you, but also quick and easy to make." Combine bell pepper, tomatoes, onion, and garlic in a blender; blend until smooth. Transfer mixture to a Dutch oven and cook over medium heat, stirring until mixture starts to brown, 5 to 10 minutes. Add water, lentils, basil, Italian seasoning, salt, and pepper. Bring to a boil, cover, reduce heat to low, and simmer until lentils are soft, 25 to 30 minutes. Meanwhile, heat olive oil in a skillet. Add mushrooms and season with salt and pepper. Cook until tender, stirring occasionally, 4 to 5 minutes. Add cooked mushrooms to lentil soup and simmer an additional 2 to 3 minutes. See how to make a hearty, healthy, and flavorful vegetarian soup. I used veggie broth instead of water and added double veggies. Very filling and delicious! This is great and so easy to make! We really liked this soup. Very comforting and easy to make.